This is one of the adorable (although I could think of several other less complimentary adjectives) rabbits that are wreaking havoc on my Black Eyed Susans. I get up most mornings to rabbits in the flower bed, and, invariably, where a tall Black Eyed Susan once swayed gently in the breeze, just about to open its bloom, there now sits one bare stalk - leafless, bloomless - and gnawed down to about 8 inches tall. I'm torn between enjoying the playful antics of these furry, cottontailed marauders (they're SO cute, and they do have to eat too) and wanting to protect my flowers that I've lovingly planted, watered, fertilized and babied. Not wishing to harm the rabbits, I'm trying red pepper. So now if they nibble on a flower, it will no doubt be the spiciest food they've ever eaten. We'll see if it works. We live on a farm... there's vegetation everywhere, so it's not like there's a shortage of rabbit food around here. In the meantime I decided to make the best of the situation and get in some painting practice using one of my furry little pillagers as the subject. This is not a "fresh" painting - I worked parts of it to death - but it's okay because I wasn't aiming for a pretty painting. I was aiming for some time to experiment, practice and just observe what works and what doesn't work for me in watercolor. I tried to completely suspend judgement - silence the inner critic - so I'd be free to experiment and enjoy. And enjoy I did! - I give up the white space too easily and too quickly. I don't know why I have a tendency to want to put paint everywhere, but when I do, I'm never happy with the result. I love watercolors that have little chinks of white scattered throughout the painting .... gives it so much life and sparkle. I want to discipline myself to keep that in mind when painting and keep more white. - I need to stay focused on what I'm doing when the brush hits the paper. The more focused I am, the more likely I won't have to rework that area. When my mind starts drifting while the paint brush is still moving it's almost never a pleasing result. Focus, Teresa! - It's good to allow myself time to "play" as I did with this painting. By playing, I'm gradually developing what Laure calls a "visual vocabulary" and, as with words, the larger the vocabulary, the easier it is to clearly express yourself. "Mistakes are essential, they surprise and challenge you. It's how you learn. I would rather a piece with a thousand vibrant mistakes than one of dead perfection." A thousand vibrant mistakes vs. dead perfection. I love it! If you get a chance, drop by and visit Keith here. He's got some great people sketches and a quirky sense of humor. Love the name of his blog, "Lining a Drawer".... because, he explains, Drawing a Line was already taken! In the meantime, I'll let you know how the red pepper works. Your lovely little painting of the rabbit reminds me of Beatrice Potter's work. You might try another one with the flowers surrounding the rabbit, or rabbits, that they love to eat! The more you paint the better you will get. And yes, leaving some sparkling white areas is one of the things that is magic in watercolour. I hope the red pepper works! This is adorable. A t least your plant nibblers are cute - my plants get eaten by slugs all the time. yuk! Hi Teresa!! I so hope you're well! Yep, rabbits -- want to borrow one of my cats?? LOL They keep a lot of 'wildlife' at bay! LOVE the painting ....!!! Are you readying for blueberry season? Mine are almost ready to pick! Those cottontails can be a nuisace but are more fun. I have a new born one now that is a lot of fun watching as it scamps about my yard. Am even thinking of using it on my next painting cahllenge blog?? Thank you for your comment on my grand daughter. I have 6 of those[4 girls and 2 boys]and they are all great kids and even greater adults. We are now getting fresh blueberries and they are so much better than frozen. Just thought I would throw that in. And I love Keith's comment and I'm off to visit his blog as well! I can imagine how destructive rabbits are in your garden but at least they have provided you with an inspiring subject to paint. I don't think any of us are totally satisfied with our work, I know I can always find things in my paintings which I hate but then sometimes you just have to leave it be and learn what works and what doesn't. You have captured a very life like creature with a sparkle in his eye! It's slugs my way. Eating everything. And they don't score high on the drawabilty factor. Disney never had the urge to do a film about slugs. No slug version of Watership Down. But great sketch, the ears are very good, the soft hollow of them is perfect. And huge thanks for the mention. Only just realized. First time anyone has done that, bit embarrassed, but the people you have sent over are great. In one generous gesture you have doubled my followers. Good luck on the peppers. Let us know if the peppers work! Eating black eyed susans? I have never had that happen, yours must be especially yummy! I see what you mean about the white and light in the painting. I feel like I'm learning something about watercolors! 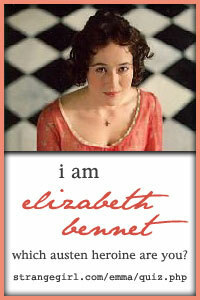 I second the Beatrice Potter reference. And this cottontail is charming! I know what you mean about not leaving the white space in watercolor. I have a very hard time with that too and then tend to overwork. What a fantastic painting! The little rabbit is adorable (although I do hear and understand your frustration at having to share your Black Eyed Susans!). I love how you have painted the foreground vs. the background - it definitely gives the impression of depth in your page. I think the grass in the foreground is GREAT!! It looks so real. Thanks for sharing the other thoughts about 'mistakes' - I'm learning to go with flow a bit too and try to accept my mistakes and welcome the lessons I learn from them. Ahhh.... bunnies.... such adorable pests, aren't they? I know what you mean about leaving white spaces. I think my tendency is to hurry up and "color" everything in. Sometimes I feel like I'm back in grade school where I must color in the lines and then wonder why my painting lacks vibrancy. Your bunny sketch is great. Poor Teresa! We have an explosion of rabbits this year even with the expanding coyote population. We lost so many zinnias and other plants that we now have very unsightly wires around all the flowers and a double fenced garden! 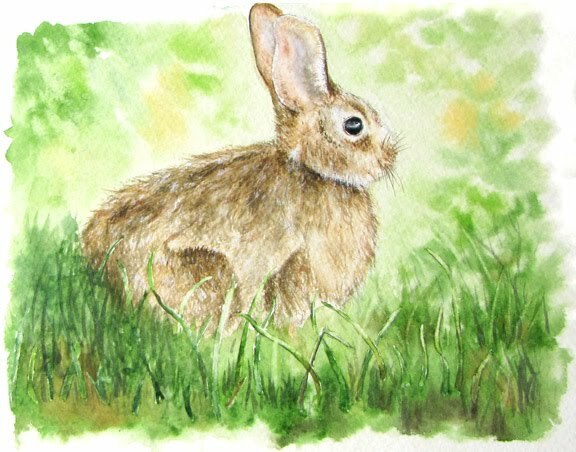 Your bunny painting is so cute though - glad at least one of those pesky wabbits was good for something!